The beautiful burgh of Linlithgow charmed the pants off me when I went there a few years ago. The town sits astride the Forth and Clyde Canal (which I’ve written on extensively) which is around half way between Edinburgh and Glasgow. There’s a train link on Scotrail which goes between cities that takes you there, and there’s a freeway as well the M9. The town oozes history and character and it’s the perfect place for a weekend out of the city during the spring or summer. Linlithgow began as a humble burgh (town) in the 12th century. It’s mentioned in King David I’s charter where it mentions the establishment of a mansion and church. During the reigns of both Malcolm IV and William the Lion, the Scottish kings are known to have resided there sometimes. The small burgh of Linlithgow became a medieval city of growing significance in the 15th century. Linlithgow was the birthplace of ill-fated enemy of Queen Elizabeth I and mother of the modern British royal family – Mary Queen of Scots aka Mary Stuart. The preserved ruins of the Royal Palace sit in a picturesque setting next to Linlithgow Loch. Sitting alongside the Palace is St Michael’s Parish Church – a building dating from the 15th century, on the site of an even older church. Patron saint of Linlithgow St Michael gives the town its motto which is found burnished into the wall of St Michael’s Parish Church – “St Michael is kinde to straingers”. In medieval times, Linlithgow was known for its thriving leather trade, involving the manufacture of leather and shoe making, with almost 300 people involved in that trade. Also cloth was a vital resource made here for nearby Edinburgh. In the 19th Century paper making and whisky distilling became important with the opening of a whisky distillery in Linlithgow and paper mill. With the completion of the Forth and Clyde Canal (aka Union Canal) between Edinburgh and Glasgow, which I have written about extensively here, trading boats and fishing boats bustled through the town. This was followed by the railway shortly afterwards which superceded the canal for trade. On the day we went there, a bustling farmers market was going on, with all kinds of fresh fish, vegetables, crafts and handmade goods. Also present were some older retirees with their fancy vintage cars, which looked to date around WWII era. I have no idea about what kind of cars they are, but they looked nice! In terms of amenities there are many in Linlithgow. There are lots of real-ale pubs, guest houses and B&Bs, pharmacies, speciality shops, cafes and restaurants and lots of lovely houses overlooking the loch. I found myself in love with Linlithgow and wanting to live there, we went there on one of those sunny perfect Scottish days that are as rare as hen’s teeth and we relished every second of the sun’s presence. In terms of real estate you can buy an apartment or semi-detached for a fraction of the price you would pay in Edinburgh. Ah the potential here! In short, huge mountains of medieval history, bloody, tragic and complex took place in Linlithgow which makes it a fascinating place to have a look around in and stay a while. 1291 – Edward I (Langshanks) sought to assert his authority over Scotland during the Scottish War for Independence. He camped near to Linlithgow before beating William Wallace in the Battle of Falkirk. 1314 – Edward II resided in Linlithgow until he was defeated by Robert the Bruce at Bannockburn. 1337 – Edward III’s English army laid waste to Linlithgow’s wooden buildings setting them on fire, afterwards there was nothing left. 1349 – The Black Death (the plague) reached Scotland and killed a third of the population of Edinburgh. The King, parliament and court took refuge in Linlithgow and hunkered down, not letting anyone in until all was safe and well. 1368 – Bustling and busy again, Linlithgow outstripped Stirling as a market town in sheer size. 1424 – Fire destroyed most of Linlithgow as well as the parish church and the royal manor house. So King James I commenced rebuilding Linlithgow’s Royal Palace to the glory that we see today. The Palace was then improved upon by successive kings James IV and James V, who presented it to his second wife, Mary of Guise (the mother of Mary Queen of Scots). 1526 – The Battle of Linlithgow Bridge, when James Hamilton, Earl of Arran, supported by Archibald Douglas, the Earl of Angus, won the day against a force led by John Stewart, Earl of Lennox. 1540 – The town elects a Provost Henry Forrest of Magdalene who leads a council of 27 members, including 4 baillies, a treasurer and 8 deacons elected by the craft guilds – the baxters (bakers), coopers, cordiners (shoemakers), fleshers (butchers), smiths, tailors, weavers and wrights. 8 December, 1542 – Mary Queen of Scots was born in Linlithgow on 8 December 1542. As an infant she remained here for seven months before being spirited away by her mother to the greater security of Stirling Castle. She didn’t return for 20 years. 1570 – James Hamilton of Bothwelhaugh assassinates Regent Moray using a hand-held gun. 1603 – James VI departed for London in 1603, where he became James I of England. 1633 – Charles I made an official visit to Linlithgow and stayed in the Palace. 1650 – Cromwell defeated the Scots at Dunbar barricaded himself and his army into Linlithgow’s Palace which he fortified. 1691 – More than 2,500 souls live in the town which I known for its linen cloth. Nearby town of Bo’ness is the main centre for foreign trade. 1746 – The Duke of Cumberland and his 10,000 troops set up camp and fires in Linlithgow, fail to put them out and accidentally destroy the palace yet again. 1787 – Scottish Poet Robert Burns visits Linlithgow but writes that he’s nae well impressed by it. The Royal Palace at Linlithgow is guarded by a grandiose gateway that is still present on the eastern wall although the original drawbridge and ramp have long disappeared. The interior of the palace is known as one of the finest medieval interiors in Scotland and dates from James IV. 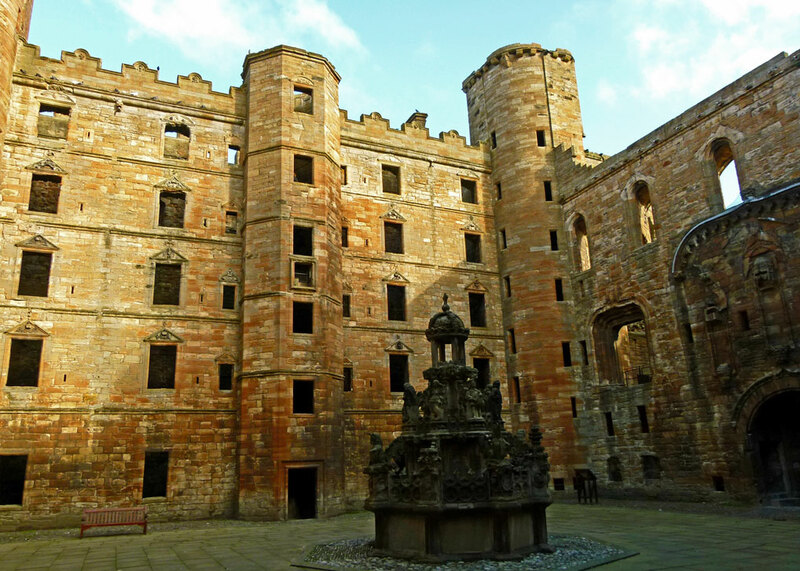 Mary of Guise-Lorraine (Mary Stuart/Mary Queen of Scots’ mother) is reported to have compared Linlithgow Palace to the noblest châteaux in France.